The upper-level air conditions could elevate the risks of tornadoes and hailstorms. Storms that tore through North Texas Tuesday night and Wednesday morning continue to move east, with the Mississippi Valley in the severe weather bull's-eye. The Storm Prediction Center warns that northern Mississippi and western Tennessee on Thursday will have a moderate risk of severe thunderstorms, one of the National Weather Service's most elevated risk levels, as a cold front moves slowly across the Mississippi Valley, triggering thunderstorms as early as midday. The center predicts "an active severe weather event" Thursday from New Orleans to Cincinnati. The storm system already led to the traffic deaths of three storm chasers in West Texas and two brothers who touched a downed power line while playing in Fort Worth, Texas. A truck driver was killed when strong winds blew his rig off Interstate 40 in El Reno, Oklahoma. The National Weather Service said a tornado with winds between 60 and 110 mph (100-175 kph) struck an apartment complex in southwestern Houston on Wednesday morning, damaging carports, windows and roofs. No injuries were reported following the tornado, rated as an EF-0 or an EF-1 on a six-level scale of tornado damage. Later Wednesday, damaging winds knocked a shipping container on a truck, injuring two near LaPorte, 20 miles (32 km) east of Houston. The Port of Houston said it didn't know if a twister was to blame. Fire officials in Fort Worth said Wednesday that two boys, ages 11 and 12, were electrocuted by power lines downed during the violent weather. The boys were brothers, a family member told Telemundo 39. 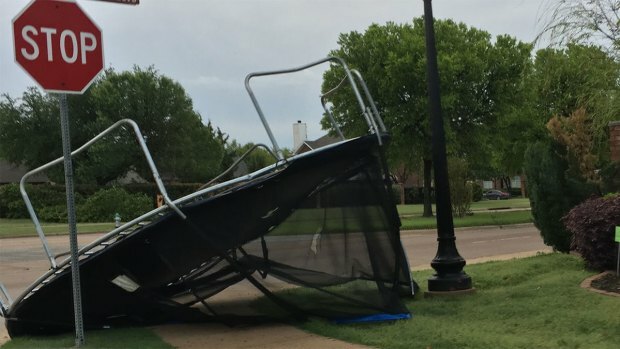 Late Tuesday, storms struck Oklahoma and North Texas with tornadoes, tennis ball-sized hail and powerful winds. Roofs and walls were ripped away early Wednesday from homes in Rockwall, northeast of Dallas, and the city's mayor, Jim Pruitt, said one person suffered non-life-threatening injuries. In Oklahoma, a truck driver was killed Tuesday night after strong winds pushed his rig off the interstate in El Reno, outside Oklahoma City, according to the Oklahoma Highway Patrol. Forecasters confirmed a 95 mph (150 kph) wind gust in the area when the crash occurred. In Texas, the three storm chasers -- including two who were contractors for The Weather Channel -- were killed in a collision at a remote intersection near the town of Spur, about 55 miles (90 km) southeast of Lubbock. The channel said in a statement that Kelley Williamson and Randy Yarnall were "beloved members of the weather community" who had worked as contractors for the channel. The Texas Department of Public Safety said the two died Tuesday along with another storm chaser, 25-year-old Corbin Lee Jaeger of Peoria, Arizona. The Fort Worth Fire Department says two children were electrocuted by downed power lines at Oakland Lake Park. Williamson and Yarnall were both from Cassville, Missouri. Department of Public Safety Sgt. John Gonzalez says a Chevrolet Suburban driven by Williamson ran a stop sign and slammed into a Jeep driven by Jaeger. Yarnall was a passenger in the Suburban. All three were killed instantly. Tornadoes had been reported nearby at the time of the crash and heavy rain was reported in the area.